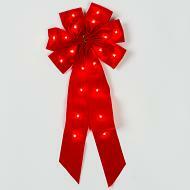 Mr. Light offers red, fabric Christmas bows (ribbons folded into a bow) with lights or without lights. We use a velvety fabric which is nice to the touch, and looks great! Each bow has a strand of 20 warm white LED lights hand-stitched into the fabric. These unique lighted bows come with battery case using three AA batteries (not included) and hidden electronic timer for 6 hours of light per evening, then off for 18 hours, and back on at the original start time each following evening. Lasting time using normal AA batteries will exceed 30 days before the batteries need replacing. 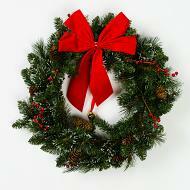 We also have 18-inch wreaths with a removeable red Christmas bow, and 24-inch wreaths with a removeable red bow. No lights if you select the unlit bow, but even so the bow brightens up the wreaths and adds fun color and Christmas cheer to the Christmas season. For the individual fabric bows, we have lighted versions with 20 white LED lights on the bow, and also an unlit version of this Holiday red bow. 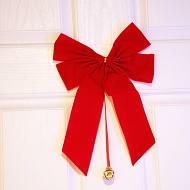 Lighted or unlit bow are great for holiday decorating, indoor and outdoor. 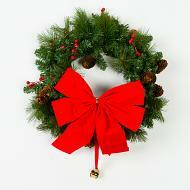 Put them on fence posts at 10 ft. intervals, or put a couple of bows on your mantel next to your Christmas stockings. Bows also work great on your front door, and fabulous when you have one bow on every window facing the front of your house. 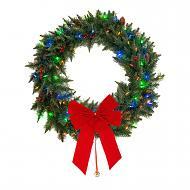 And, kids love to have a lighted Christmas bow on their bedroom door, reminding them of the happy holiday season, and with cheery lights as they count down to Santa’s arrival. The lights on the bow are also a good reminder to good little boys and girls to go to sleep when they automatically turn off at the time of your choosing. Just set the start time so that it’s six hours before your preferred bedtime, and they’ll send a silent message when they turn off that it’s bedtime. The lighted bows also serve as a nice complementary product to our lighted wreaths and lighted Christmas trees, and at a very affordable cost. The battery compartment of each bow attaches to the bow with double-sided Velcro, and there’s an additional double-sided Velcro piece on the other side of the battery compartment for attaching the bow to a door, or mantelpiece or fence. So, these bows don’t require that you hammer a nail anywhere. Just take the Christmas bow out of the box, add the three AA batteries, and peel off the adhesive from the outer battery box Velcro set, and you’re done! The mini-LED lights on the red bow are warm white color, which means slightly yellowish in color tone, and so the lighting effect is not harsh, but warm and fun. Another use for our Mr. Light Christmas bows, lighted or unlit, is for wrapping presents. What fun to have a pre-lit bow atop that special wrapped Christmas gift! Imagine the kids coming down Christmas morning to find that special present that they have been hoping for illuminated with a lighted (or unlit) bow. Special people deserve special gifts, and there’s no better way to show them that you think that they are special by including our special Christmas bows. After unwrapping the present, the recipient gets to use the bow again for decoration wherever they choose. Using the bow to top off the wrapping of a Christmas gift means that you’re giving Two gifts!